When I was in high school someone gave me a box of vintage clothing. I no longer remember who (or why?) but I do remember that I had some fun playing around with the various looks! In anticipation of a Halloween blog post, I stopped at my mom’s house this weekend and salvaged my costume box from her attic. Back at home I decided to try on a couple of my favorite old pieces but was very dismayed to realize they no longer fit. Not by a long shot. Not even close. Like, how did I even wear this stuff at one point? Anyway, I digress. While I’d hoped to bring you a live shot, thanks to middle age spread, you get a hanger shot instead. It doesn’t change the fact that vintage shops can help inspire some fantastic and authentic Halloween looks. Below is a 1950-60’s era strapless party dress. Style it with a cardigan, bobby socks and saddle shoes or; for a dressier look, with party heels or flats. Add some pearls, style the hair in a bouffant or a flip and you’ve got an fun and feminine Halloween party look. While not particularly versed in the history of costume, I’m guessing the piece below may be either Victorian or Edwardian. 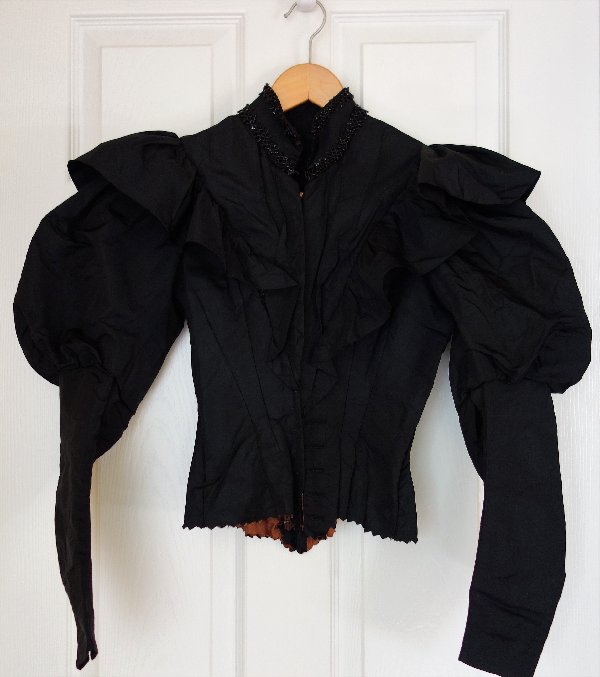 The Victorian era may have leaned more toward the puffy on the top, tight on the bottom sleeve styling. It has only hook and eye closures and several areas of beading detail (see close-up). The waist is super-super tiny (about 22 inches according to my measuring tape) but I’d love to wear it if I could fit into it today! 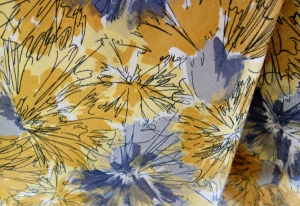 Picture it with a long black skirt, pointed toe, lace-up granny boot and parasol. Perfect for those fans of BBC period dramas! 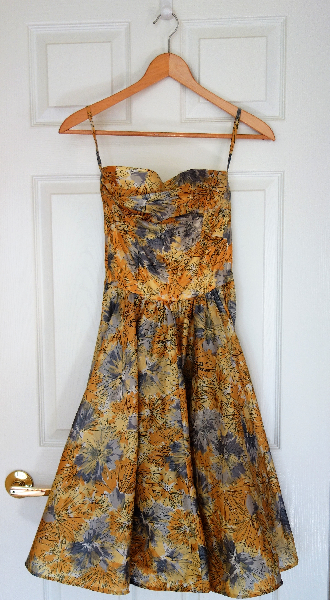 For authentic vintage pieces, check out Ballyhoo Vintage Clothing, Etsy and Rusty Zipper. 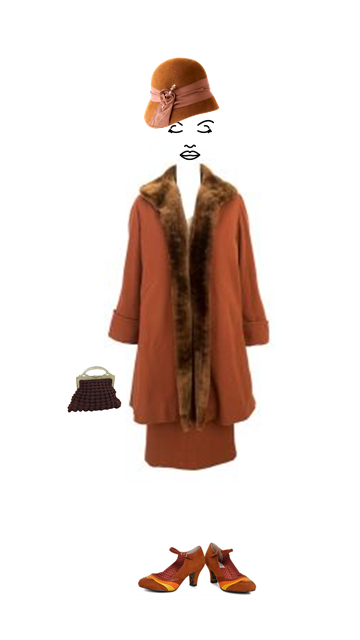 Loving this 1930’s coat ensemble! 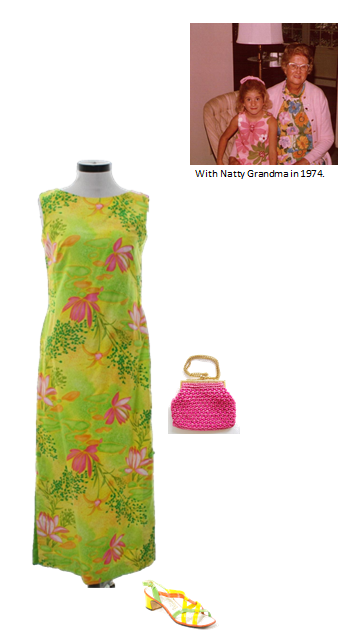 And who (of my age, at least) doesn’t remember the Hawaiian print fad of the late 1960’s – early 1970’s? I found this picture of me with my grandma rocking the look back in March of 1974! Maybe rummaging around in a vintage store just isn’t your thing but you DO like the idea of some vintage inspiration. If so, check out these retailers and have fun playing dress-up this Halloween! Ooh, I love vintage anything! These are such amazing pieces. What a shame that they don’t fit. I guess that gives you reason to go search for more vintage pieces that do fit! Happy shopping! And thanks for sharing with us, Elizabeth, and for linking up with me. I know, right? So wanted to wear the 1950’s style dress! But like you said, good reason to go hunting for new vintage finds! Have a great week!